Are you intrigued by the way people behave? Do you want to learn more about the underlying concepts that drive humans to behave the way they do? Then studying Psychology might be the right choice for you. Psychologists try to comprehend human behavior by formulating theories and then testing them by means of research. Since our behavior is determined by a variety of factors, a lot of different theories exist. If you decide to study psychology in Maastricht, you will be introduced to all major theories and disciplines within psychology. The programme's emphasis gradually shifts towards a dual focus: cognitive and biological psychology. From the onset research will play an important role: learning how to independently establish and carry out a scientific research project is an important pillar. Why study Psychology at Maastricht University? 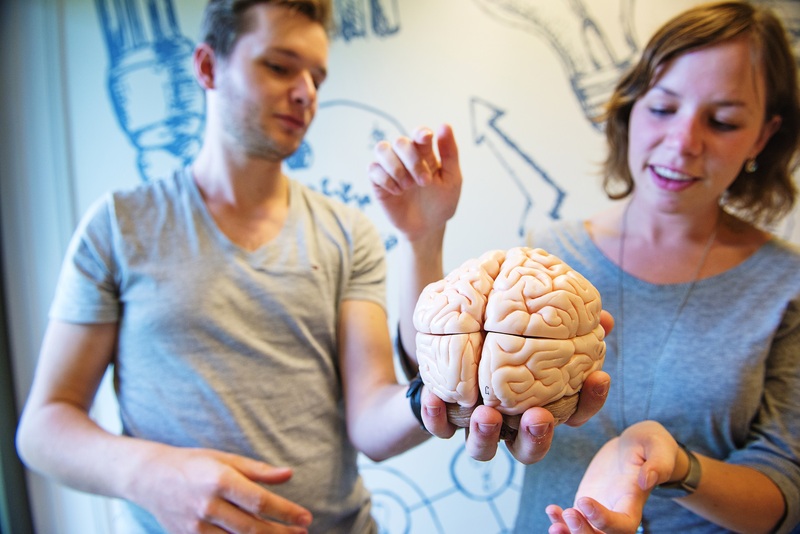 At Maastricht University, we will train you to become an expert in cognitive and biological psychology. Cognitive psychology looks beyond the visible behavior of people. You study what goes on in the mind of a person, such as a language, memory, thought and perception. These processes influence our behavior, whether it be on a rational, subconscious or emotional level. In biological psychology, we assume that everything we consciously or unconsciously do and think is due to patterns of activity in the brain. You examine the brain by using advanced methods, including the latest brain-imaging techniques. This knowledge is transferred to you by an innovative teaching method called Problem-Based-Learning. The PBL-method offers real and challenging problems that you’ll have to solve independently and as a team, guided by the supervision of a tutor. Being actively encouraged within the learning process helps you to learn much faster and to better remember what you’ve studied. The Bachelor in Psychology is a three-year programme. You can find the list of courses that you will follow during the first, second and third year on our programme website. With a Bachelor in Psychology at Maastricht University, you have diverse career paths to choose from; be it as a health-care psychologist at a hospital, a policy advisor for the government or a researcher at a research institute. On our website, you can find more information on the master’s programmes offered at Maastricht University as well as career prospects for your future. The bachelor's programme in Psychology is a fixed programme with selection by the educational institution. This means that you go through a selection process after applying. The application closes on 15 January! Not everybody who is admissible will also receive placement. The admission requirements and the application procedure are explained in detail on our website.